The Four Color Media Monitor: Did Marvel vs. Capcom: Infinite sales flop? And why? Did Marvel vs. Capcom: Infinite sales flop? And why? In the case of Marvel Vs Capcom: Infinite, there’s a growing sense of wariness and concern among gamers that sales may not be as noteworthy as that sixth place looks on the NPD charts. In fact, EVO head honcho, Joey Cuellar, noted that the game tanked but didn’t provide much context beyond that. Saying he has the numbers and that it tanked might seem like a lot of grandstanding and posturing, but the reality is that the surrounding sales data seems to coincide with Cuellar’s brief albeit telling tweet. During the first month of release we reported how the digital sales data did not paint a good picture for Marvel Vs Capcom: Infinite on the PlayStation Network nor on the Steam charts. In fact, the game – as of the writing of this article – has only moved 36,000 copies on Steam, according to Steam Spy. The sales data in other territories doesn’t look much better. Back in September Metro reported that Marvel Vs Capcom: Infinite was tracking like a flopping fish out of water on the GfK Chart-Track for the U.K., regional sales. In fact, according to Metro, Ultra Street Fighter II on the Nintendo Switch had a better debut in the U.K., than Marvel Vs Capcom: Infinite did on multiple platforms. I wonder why the failure, if their data is accurate? One reason could be because of the emphasis on the PC costumes mandated by Joe Quesada's SJW-pandering editors, including at least one costume that made its way into the game. It could also be that they added the peculiar guise of "Major Carol Danvers", where she fights without a costume per se, and rather, in an army jacket and sunglasses. Or, it could be that the game just pales beside its predecessors in terms of quality. 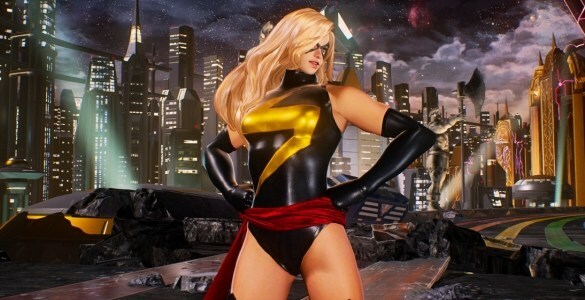 Although, if the picture here says anything, they did provide Carol Danvers' best costume, the black one-piece with a lightning beam on it, created by Dave Cockrum, an artist with far more talent than what Marvel's employing today. If they did, that demontrates the huge disconnect between comics and the merchandise based on them, although undoubtably, editorial mandates by the comics publishers proper can wind up playing a role in what the video game designers are allowed to make use of. But if this Marvel vs. Capcom installment does suffer from political correctness, then its failure is well deserved, and besides, licensed merchandise cannot be allowed to eclipse the original products in every way.